The Grand Hotel Mediterraneo overlooks one of the famous Arno river in Florence, near the beautiful Piazza Santa Croce, with a gorgeous view of the city Renaissance beauties along the river Arno and the hills of Florence. The Grand Hotel Mediterraneo has a wonderful view over the famous river Arno banks (called "Lungarni"), near the beautiful Piazza Santa Croce, with a stunning panorama of the city Renaissance beauties along the river Arno and on the Florentine hills. Whether you are staying in Florence for work or for a sightseeing tour, you will find the warmth of the typical Florentine hospitality, in a modern and comfortable setting. 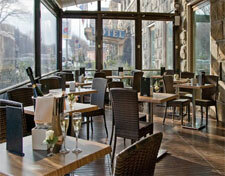 The hotel position is ideal for its closeness to the city historical centre. The Grand Hotel Mediterraneo is very close to the most important monuments, including Piazza Santa Croce, Piazzale Michelangelo, the Uffizi Gallery and Ponte Vecchio. At walking distance from the hotel you can find the most glamorous shopping area, such as Via Tornabuoni, Via Roma, Via Calzaiuoli and Via della Vigna Nuova. In the relaxed and quiet atmosphere of the Grand Hotel Mediterraneo, the chefs of the three in-house restaurants - the Taverna, the Ristorante Arno and the Ristorante Fiesole - are ready to welcome you to let you try the delicious specialties of the traditional local cuisine. The American Bar and Lounge is the right place to enjoy a wide choice of drinks before or after dinner. The hotel also features two in-house boutiques where you can try and choose stylish hand-made leather items at excellent prices. In the hall there is an Internet Point, available 24 hours a day: another service to give full assistance for all your needs. The Grand Hotel Mediterraneo offers its customers the best services to ensure a comfortable and unique stay: safe and handy garage and parking, wide choice or different rooms (Superior, Business, Superior e Classic), some of them with an unforgettable view over Florence and the surrounding hills. The Grand Hotel Mediterraneo can organise business conventions or private banquets, with the possibility of dedicated areas, such as the Taverna, with its comfortable and cosy atmosphere. Moreover, the Grand Hotel Mediterraneo Congress Centre, which has been fully renovated, is equipped with last-generation technologies and can house 12 meetings at the same time, with 280 seats in the plenary hall and 800 places altogether. The rooms at the Grand Hotel Mediterraneo are also equipped to allow access to the disabled. Upon request, smoking rooms are also available. At the Grand Hotel Mediterraneo your pets are accepted, provided they are small in size.